I'm not a fan of celebrity worship, celebrity obsession, celebrity endorsements, or celebrity-themed anything. But there are exceptions to every rule. I've put off buying Wayne Gretzky wine and Wayne Gretzky whisky because I'm cool like that. Let the mindless masses buy something simply because the Great One's name is on it; I can't be swayed that easily. Or so I thought. 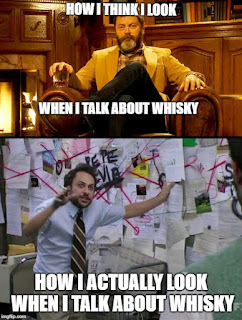 More than a few people I know and trust had positive things to say about the wine...and about the whisky. So I gave in and sampled some Wayne Gretzky No.99 Red Cask. But why not call it Hat Trick or M.V.P. or Slapshot, or something hockey themed? I mean, we're talking about the greatest hockey player of all time, right? (Bobby Orr and Mario Lemieux fans, your objections are noted) Perhaps they wanted to be taken more seriously. 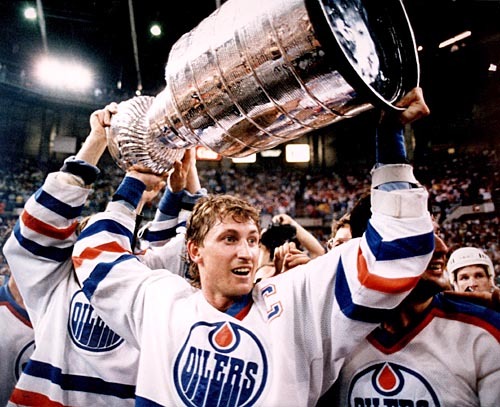 Wayne Gretzky No. 99 'Red Cask' Canadian Whisky is made in small batches from grain (rye, malted rye and corn) that has been individually mashed, fermented and distilled. After aging, the whisky is finished with red wine casks from the Wayne Gretzky winery. The whisky doesn't carry an age statement, so you can only assume it's 3 Years Old, since those are the legal requirements for whisky in Canada. Are there older whiskies in here? Maybe, maybe not. But how does it taste? Nose (undiluted): Dark Brown sugar, maple syrup, a hint of roses, a touch of leather. Give it time to rest in the glass and some red grapes, apples and citrus notes appear. Finish: medium-short finish, with some red grapes and oaky red wine notes initially and a touch more rose/perfume reappearing with time. Adding water didn't really improve this whisky. Nor did adding ice, unless you find it a bit too sweet when sipped neat. Ice toned down the maple and brown sugar sweetness and brought the floral and wine notes forward a bit. This one develops complexity when it's given the chance to sit in the glass for awhile. The vanilla and oak notes become more prominent. Letting it sit may prove a tall order, however, as this is a very easy-drinking whisky. It's easy to be cynical and dismiss celebrity-branded products. I'm guilty of walking right past this whisky several times and scoffing (internally) at those marveling over "a Wayne Gretzky whisky". As much as I try not to be a snob, I was guilty on this count. This whisky is very easy to drink. If you like big, oak-rich red wines, you will like this whisky. In fact, this whisky made me want to try some of Gretzky's red wines. I'm curious to see if these notes are present in his Baco Noir or Shiraz Cabernet. It is rich, complex, affordable, and let's face it, a Wayne Gretzky whisky makes a great conversation piece. It may be a love it or hate it whisky when it comes to tasting, though, as the oak and red wine notes become more dominant with time. You should try before you buy.